The New York Times isn't the newspaper it was in the old days. Today, its editorial and news outlook is something like a far-left blog. The radicals have taken over. It's not independent but is part of the Democrat Party. It almost seems illegitimate that it should have the same name as it did in days gone by. The latest example of so many: Ted Cruz is a conservative running for the Republican Party presidential nomination. He has written a new book called "A Time for Truth." According to Politico (left of center! ), the New York Times refuses to list this book on their bestseller list despite the fact that it has outsold all but two titles on their current list. The reason? "In the case of this book, the overwhelming preponderance of evidence was that sales were limited to strategic bulk purchases," she wrote. “No evidence of bulk orders or sales through any retailer or organization,” says the publisher, in a rare rebuttal to the all-powerful Times. The New York Times, again, is running away from its responsibilities as a news source. It is certainly politically biased against Cruz and all conservatives. No one can seriously doubt that. And now a reason has been found to keep a conservative political candidate off their list. I defy anyone to cite a case where this happened with a liberal. 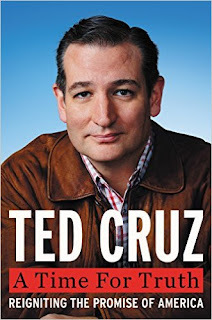 In light of the HarperCollins statement, the New York Times needs to provide evidence of "bulk orders" and such or admit the exclusion of Cruz's book was politically motivated, and place it on their bestseller list. The New York Times has a lot to prove as an honest news source. Everything is slanted toward the Democrat Party and the far-left side of the political spectrum. No pretense to objectivity or independence that I can see. I could say just about the same for other prominent mainstream media sources, such as the Washington Post and USA Today. "These are discouraging results for those of us who have spent our careers in journalism. In 23 years in newsrooms, I saw consistent and concerted efforts to get stories right. Clearly, the public's not convinced." I find that an odd statement from someone associated with USA Today. I follow their news and they are just as biased, as liberal, and as juvenile as any other major mainstream newspaper. If he doesn't see that, he's in the wrong business. He's blind, but the public can see what's up. I assume most others in the newsrooms of the New York Times, USA Today, and Washington Post are well aware of their own bias but somehow they think of it as a good thing and somehow what they are doing is good for journalism and the country. People can convince themselves of anything, even that.